Before the Gold Rush, a vast wilderness of coastal dunes extended from the Pacific Ocean eastward over much of the San Francisco peninsula. As the City grew westward, this coastal dune ecosystem was consumed by development and much of the remaining wildlife habitats of today are limited to the immediate coastal areas, where a glimmer of wilderness still exists. Though they currently do not breed in San Francisco, Snowy Plovers can still be found in this sliver of wilderness, at Ocean Beach and at Crissy Field, where they reside during most of the year. Both of these locations are now under Federal jurisdiction managed by the National Park Service. Ocean Beach stretches 3.5 miles, from Lands End in the north to Fort Funston in the south, and lies within the boundaries of the Golden Gate National Parks, which itself is a component of the Golden Gate Biosphere Reserve. The long, wide beach where San Francisco meets the Pacific Ocean is home to the largest population of the City’s Snowy Plovers, where dozens of individuals reside. Here, they spend most of the day resting in the low dunes above the high tide line or foraging for tiny invertebrates that make up their diet. Many other species of shorebirds use Ocean Beach, some spending the summer or winter season, others merely a brief migratory stop as they traverse the Pacific Flyway, and large mixed flocks can be seen actively foraging for food or resting on the sands during all seasons of the year. While much of Ocean Beach is open to a variety of recreational activities, a portion of the beach has been designated as a Snowy Plover Protection Area, where specific rules are in place to protect Snowy Plovers and other shorebirds and their habitats. Monitoring and stewardship of the Snowy Plover Protection Area is carried out by the National Park Service with assistance from the local community. A military base for over 200 years, the Presidio of San Francisco is today part of the Golden Gate National Parks and is a showcase of the natural and cultural history of San Francisco. Along its northern shore lies Crissy Field, a restored historic-airfield, tidal marsh, and coastal dune shoreline. 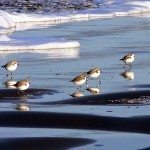 Here, Snowy Plovers reside within a designated Wildlife Protection Area which offers a safe haven of nearshore water, shoreline beach, and vegetated dunes to a variety of animal and plant species. As the rangewide Snowy Plover population recovers and grows, it is anticipated that the population at Crissy Field will increase, and biologists have suggested that breeding may once again be possible at this site.